What if Jesus Never Intended His Followers to Form a Church as we Know it Today? I looked at where the Bible talks about the kingdom of God and where it talks about church. What I learned is shocking. 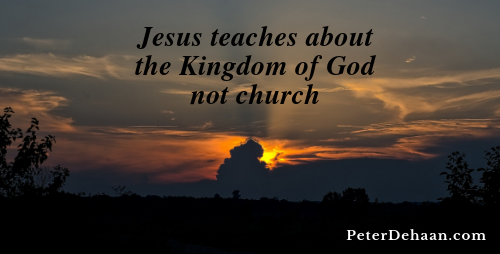 Jesus teaches about the kingdom of God, not church. Both the church and the kingdom of God (along with the kingdom of Heaven) are New Testament concepts. None of these terms occur in the Old Testament. Since Jesus comes to fulfill the Law (Matthew 5:17), the kingdom of God must be one way he intends to do so. A transition of emphasis happens in the book of Acts, with twenty-one mentions of church and only six mentions of the kingdom of God. Early on Jesus’s followers shift their focus from the kingdom of God to the church. This is logical because a church is a tangible result while the kingdom of God is a more ethereal concept. But just because this is a logical shift, that doesn’t make it right. The rest of the New Testament (Romans through Revelation) emphasizes church over the kingdom of God: ninety times versus eight. Even though the early followers of Jesus favor the practice of church over the concept of the kingdom of God, the fact remains that their practice of church then is far different from ours today. Today’s church should push aside her traditions and practices to replace them with what Jesus teaches about the kingdom of God. It will change everything. The word church occurs 114 times in the Bible, all in the New Testament. Of the four accounts of Jesus, church only occurs in Matthew and then just three times. Acts, the book about the early church, mentions church twenty-one times. The word church occurs in the majority of the rest of the New Testament books (fifteen of them). Instead of church, Jesus talks about the kingdom of God. The phrase, kingdom of God, occurs sixty-eight times in the Bible, again, all in the New Testament. The majority of occurrences are in the four biographies of Jesus, accounting for fifty-four of its sixty-eight appearances. Acts mentions the kingdom of God six times, with only eight occurrences popping up in the rest of the New Testament. I’m reminded of a phrase that a friend once shared with me about a company that was struggling to operate effectively, as upper management intended. He said, “The inmates are running the asylum!” Perhaps that captures what is going on with “the church.” While it began with a moving of the Holy Spirit, it fell into the hands of people–and all of us are flawed. I think your piece is a wonderful reminder to look back to the ultimate role model, Jesus Christ, to refocus our efforts.